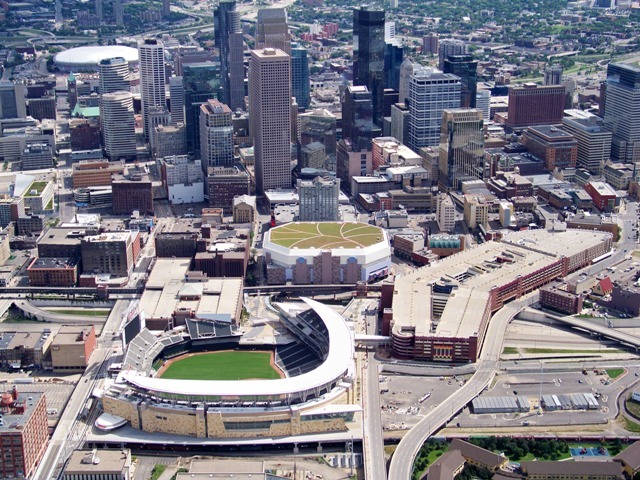 The Target Center opened in 1990 as the new home for the Minnesota Timberwolves, over the summer it had some renovations done, particularly on the roof. Instead of just leaving the roof as is, it has been made into the 5th largest “green” roof in the nation; it is also the first green roof to be installed on a sports arena. The 2.5 acre roof will be able to gather nearly 1 million gallons of storm water, preventing overflowing in the Mississippi River and damage to the surrounding area. The other interesting aspect of the roof is that it will serve a second purpose, utility garden. On top of the roof will be a variety of Sedums and Minnesota prairie plants, including Columbine, Prairie Coreopsis, Wild Strawberry, Dotted Blazing-Star, and Lupine. The lupines are intended to attract Karner Blue Butterflies which are endangered and depend on the plant for survival. Not a bad way to take advantage of the space, it reminds me very much of Sim City.